'Breath' is a video- and sound-installation for three monitors. In the back of the room two monitors are hanging from the ceiling. Right in the centre, placed some meters forward, is the third. 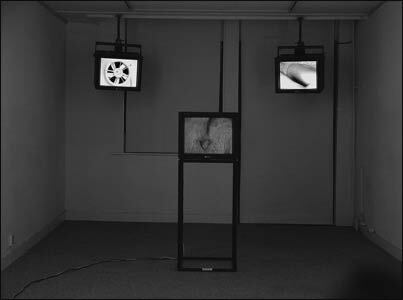 On the monitor in the centre we see the picture of an indefinable flaming red organ, of which the up and down going movements correspond with the continuously audible muffled sound of breathing. The other two monitors show a straight collage of (black and white) pictures 'from daily life'. Pictures in which human or animal presence leads to some form of sound production. With every intake of breath there is a change of picture, both left and right. During the exhalation mostly an abrupt sound is produced. All sounds and pictures comply with the firm basis of the breathing rhythm, thus forming a slurring 'musique concrète'.